Kenya Armbrister is planning for a trip like no other. 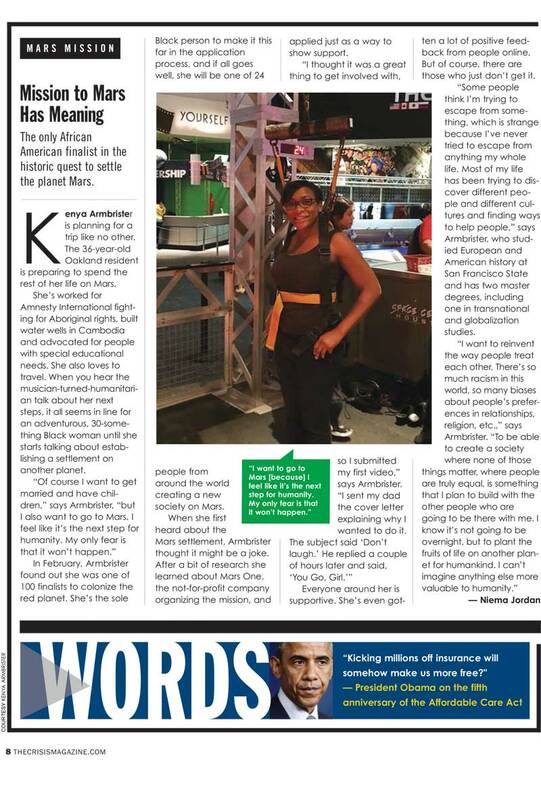 The 36-year-old Oakland resident is preparing to spend the rest of her life on Mars. Everyone around her is supportive. She’s even gotten a lot of positive feedback from people online. But of course, there are those who just don’t get it. “Some people think I’m trying to escape from some-thing, which is strange because I’ve never tried to escape from anything my whole life. Most of my life has been trying to discover different people and different cultures and finding ways to help people,” says Armbrister, who studied European and American history at San Francisco State and has two master degrees, including one in transnational and globalization studies. “I want to reinvent the way people treat each other. There’s so much racism in this world, so many biases about people’s preferences in relationships, religion, etc.,” says Armbrister.